The northern region has many cities to explore, the beautiful Lake Trasimeno where you can swim, windsurf, and even rent a canoe, Perugia, the capital, world-renown for its chocolate where there is an interesting museum of chocolate, Deruta's colorful ceramics, the wine museum in Torgiano and many small interesting hill towns including Gubbio and Citta di Castello. This area gives you the opportunity to include easy day trips to Arezzo, Cortona, and even into Marches to visit the towns of Urbino, Loretto and Ancona. The nearby Republic of San Marino, only 61 square miles and containing eight villages, is independent from Italy and is a non taxable state, a great place to do some shopping. Southern Umbria is a bit easier to explore with main highways to Florence and Rome. 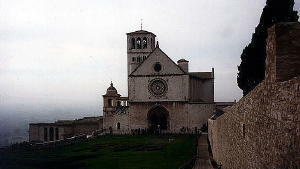 Millions come to Assisi each year to pay homage to Saint Frances and admire the beautiful Basilica of San Francesco. Spoleto, Orvieto, Bevagna, where the Roman part of town lies right next to the medieval half, Spello, and other small towns and isolated villages are waiting for you.